​We all get comfortable in our traditional roles in the family but this month we challenge you to get UNcomfortable! Step into another's shoes folks and do something you don't normally do and TRUST us, you will find more appreciation for your Partner than you thought possible! PLUS he or she just might be more grateful to you for all that you do too! What? No kids? How about pets? Could you try this with your pets? No, then find a pet project you can swap roles on - maybe its another relationship like a caregiver role? 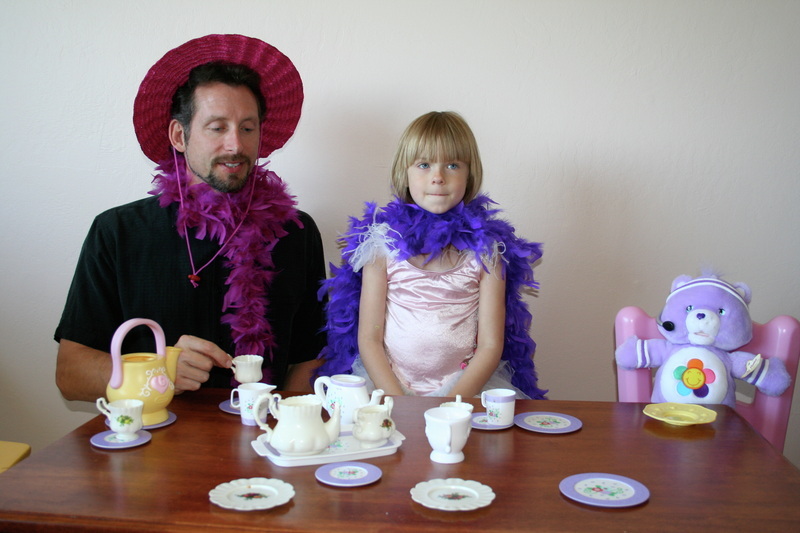 Swapping ideas - well - the tea party for Dads is an easy one (shhh - she doesn't know we put her up here yet) - for more ideas, you are in the right place! Click here for more on October! Yes, there's an app for that - 20 Free iPhone Apps for Parents! Pack the perfect school lunch! Are you ready for another switcheroo??? This month, your focus is to try to better understand and appreciate the role of you partner as a parent. This works even if your children are adults or if your children have four legs! To better appreciate (and be appreciated) - this month you will swap your daily parenting roles. Sound easy? Hmmmm - if you are the primary caregiver - will you be able to remain OUT of the picture for a day or a week or a month? Can you sit back and let your Partner do some extra parenting? It will be difficult, we know but your job is not to criticize, correct or teach. Your job is to allow your Partner some space & room to grow. Help out only when asked and do not not not not jump in and fix everything!! What do your kids like for their lunch everyday at school? What are your bedtime routines & do you have any ideas here? How are you at 7th grade math homework? What do your kids love about your different parenting styles? What can you learn about being a Primary that you don't already know?